You'll Need the Acrobat Viewer 4.0 to use forms available through this page. 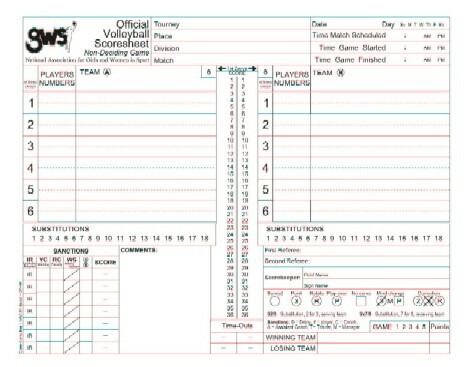 These forms are modified USAV forms. When you open the form, you can mouseclick or tab through the Header Section, Team Names, and Officials Section so you can create customized sheets for your match or tournament. The forms will open in the Adobe Acrobat Reader. If you do not already have the Reader, it is a FREE download at http://www.adobe.com . If Adobe Reader opens in your BROWSER, then click the "BACK" button/arrow on your browser toolbar to return to this page. If Adobe opens in a separate window, close Adobe Reader to return to this page. 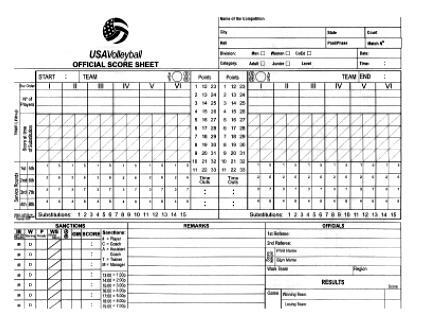 NOTICE: NAGWS SELLS these scoresheets through the Officials' Site at http://www.pavo.org, for $15.00 in either print or electronic versions. These copies are posted for your informational purposes only. Internet Explorer 5.x: Right Click the link above, choose "Save target as..." and designate where you want to save the file on your computer. Netscape Navigator 4.x: Right Click the link, choose "Save link as..." and designate where you want to save the file on your computer.